Southeast Asia isn't all temples and beaches. Its dark side, while not readily apparent, is available to anybody who goes out of their way to see it. The museums in this list show you a less pretty picture, drawing on the region's bloody history and folklore. They don't always pile on the gore, but many of them have a vested interest in promoting a particular version of the past – whether it's the glorious role of the Army in Indonesia's and Myanmar's histories, or the horrors visited by foreign invaders on Vietnam, Singapore and Malaysia. Dead babies in formaldehyde? Check. Preserved parasites? Check. A mummified serial killer? Check. The Siriraj Medical Museum in Bangkok's Siriraj Hospital is nightmare fuel for the unprepared, with exhibits dedicated to creepy-crawlies, murder victims, autopsies and deformed stillborn infants. The Museum ostensibly serves as a teaching venue, but its macabre subject matter holds a wider appeal. The part of the museum dedicated to unnatural death gets into exceedingly gory detail, with photos of autopsies, displays showing actual murder weapons, and the piece de resistance, the mummy of Si Ouey, a cannibal who devoured children in the 1950s before he was caught and executed. Located a short distance from the Grand Palace, the Siriraj Medical Museum should easily be part of the Bangkok tourism circuit… but surprisingly, it hasn't caught on. One wonders why. 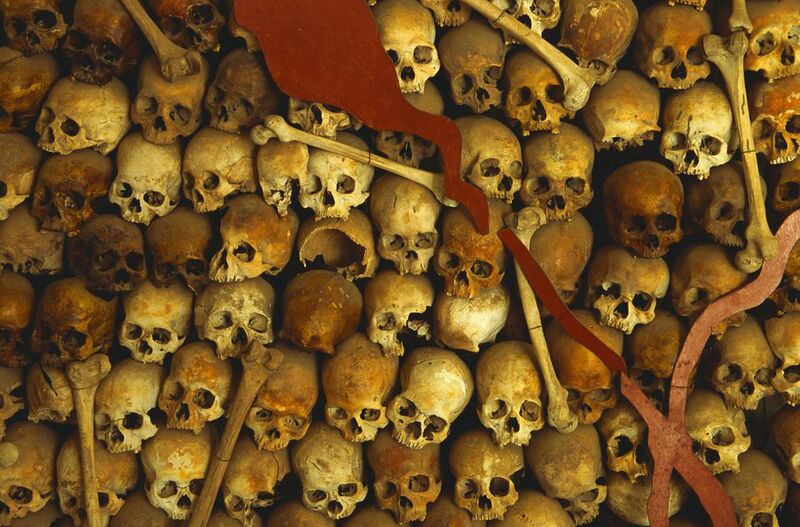 Look at the exhibits in this former school in Phnom Penh, and you stare into the abyss: the depths to which humanity can sink when blinded by a murderous ideology. About 17,000 prisoners passed through Tuol Sleng, only a handful of whom survived. The rest were declared enemies of the Revolution, then tortured and killed by drowning, electrocution, burning, and skinning alive.As paranoia in the Khmer Rouge hierarchy took hold, even high-ranking officials were brought into the prison for torture and eventual execution. The exhibits in Tuol Sleng today only hint at the full horror taking place in this prison from 1975 to 1979: hundreds of photos of the prisons victims, some already bearing marks of ill treatment; a waterboarding bed and a bare metal bedframe, both instruments of torture; makeshift cells where prisoners were held between torture sessions; and paintings by a former prisoner, depicting the tortures that took place. The Hanoi Hilton, ironically, stands only a few minutes walk away from the official Hilton Hanoi Opera Hotel in Vietnam's capital. The Hoa Lo prison was given its ironic nickname by American prisoners of war who stayed as the Vietnamese government's guests. As with most Vietnam War memorials in Vietnam, the Hoa Lo Prison exhibits tell the story from the side of the war's victors. After all, Hoa Lo Prison was also a hellhole for Vietnamese freedom fighters during the French colonial era; the exhibits do not shy away from portraying the inhumane tortures inflicted by French jailers on their Vietnamese captives, from shackled prisoners to an authentic guillotine. The American POW experience is given some lip service in a single room in Hoa Lo Prison, where you'll find walls bedecked with propaganda-infused images of clean-cut American prisoners at leisure; John McCain's flight suit dominates the room. The Japanese during World War II were capable of incredible inhumanity. The Penang War Museum attests to the blood spilled (and cruelty exercised) in the name of war: after this British citadel in Malaya (now the nation of Malaysia) was captured by the Japanese in December of 1941, the structure was used as a POW camp, where torture and executions were commonplace events. The museum in Penang devotes significant attention to the area's reputation as “Bukit Hantu” - “Haunted Hill”, where monsters and ghosts roamed in the dark. The wartime Japanese executioner – a cruel katana-wielding monster named Colonel Suzuki – is rumored to be still haunting his station, still craving for more victims. Beyond ghost stories and execution sites, the remnants of the army base excite interest for war enthusiasts, with underground military tunnels, armaments and bunkers still littering the large museum site. The island nation of Singapore suffered terribly under Japanese rule during World War II. Singapore's ethnic Chinese were regarded with suspicion by the Japanese, who associated Chinese with the Communists. Locals suffered from horrendous massacres inflicted by Japanese forces on defenseless citizens. The former Ford Factory is now a repository of the memories of those dark years. It was here where Lieutenant-General Arthur Ernest Percival surrendered the British forces to General Tomoyuki Yamashita in 1942. Now managed by the National Archives of Singapore (NAS), the Ford Factory museum archives part of the NAS collection of World War II documents, photographs and relics. The original boardroom where the surrender took place has been restored, and a Talking Map revisits the progress of the Japanese invasion through Malaya. First-hand accounts of the war years take pride of place here, from oral accounts by survivors of the war years to drawings of concentration camp life. This museum in Jakarta references a gruesome historical event that changed Indonesia's political history. On September 30, 1965 (or so official accounts have it), the Indonesia Communist Party (PKI, following the Bahasa Indonesia phrasing) attempted a coup d'etat that resulted in the murder of six generals and one lieutenant. Suharto, the Army General who led the military counter-coup, eventually gained the Presidency. The Museum of PKI Betrayal – built around the site of a well where the bodies of the generals were discovered – plays up the tragedy of the murder and the treachery of the communists. Over 30 dioramas demonstrate the evil acts wrought by PKI cadres from World War II to the 1960s. The museum contrives a happy ending to all this bloodshed: the last diorama demonstrates Suharto's accession to power, heralding a “New Order” that would last until Suharto's resignation in 1998. Occasionally, the Vietnam War claims yet another casualty in Laos. Millions of pieces of unexploded ordnance (UXO), remain from the 270 million bombs dropped in the “Secret War” waged by the U.S. UXO still claims the limbs (or lives) of too many innocent Lao, four decades after the war ended. In the Lao capital of Vientiane, the nonprofit Cooperative Orthotic and Prosthetic Enterprise (COPE) runs a prosthesis center and rehabilitation service for these victims. Their Visitor Centre explains their story with compassion and hope, albeit their re-sculpting of leftover bomb shells and prostheses can be a bit jarring. The expansive exhibit space tells several UXO-centered stories: the proliferation of unexploded bombs that still litters the Lao countryside; the victims who have their lives shattered by decades-old explosives; and COPE’s efforts to rehabilitate their lives, helping them move on. The theater shows a series of documentaries on the UXO problem and COPE’s mission in response. A gift shop sells T-shirts, mugs and other souvenirs – the profits all go back to COPE’s projects. With opium poppy farms right in Myanmar's backyard, the Burmese government feels highly motivated to wage a propaganda war against the evil drug menace in Southeast Asia. The Drug Elimination Museum in the former capital Yangon is a centerpiece of Myanmar's anti-drug message. Over three levels, visitors can view lurid exhibits displaying the horrible consequences of doing drugs. Tamer exhibits drily narrate the history of drug trafficking in Myanmar, while not-so-subtly glorifying the Army's role in the war against drugs. A “haunted house”-style walk-through displays the extreme effects of long-term drug use, with mannequins demonstrating the inexorable spiral from dancing at clubs (wait, what?) to addiction to death. The exhibit puts particular emphasis on adverse health effects: AIDS, cancer, and stillbirth are gruesomely paraded before museum-goers.